It was a little bit difficult for me to prepare for this race I didn't really know what to expect going into it. I'd never ran that many miles in a relatively short amount of time before and wasn't sure how my body would handle it. Especially running on little sleep, sitting in a van for long periods of time, and not eating like I normally do. But I tried not to overly obsess about it and just go with the flow. I figure even if the race didn't go as planned I would still be able to complete my legs of the relay and have fun! The adventure started on Thursday after work. 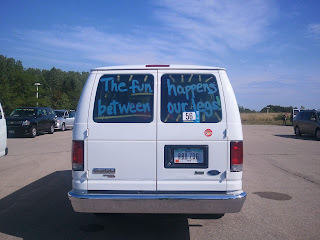 The original plan was for van 1 to leave very early Friday morning (sometime before 5 am) to make it to Madison an hour before our 8 am start time. Van 2 didn't need to be at their start location till around noon so they had the luxury of sleeping in a bit more before heading up to Wisconsin. The girls in van 1 decided that getting up when the clock had a 3 or 4 as this first number was just plain crazy especially knowing we would probably only have limited sleep on Friday night and decided to rent a car and head up to Madison Thursday evening. That ended up being an awesome decision on our part as we were able to eat a nice dinner, relax at our hotel, and get a full night's sleep before heading to the race the next morning. Ragnar staff was extremely well organized and my team zipped through the registration process - showing our night-time reflective gear, picking up crossing flags, listening to the safety briefing, and picking up our race shirts. Zip zip zip. Then it was to the starting line! Before the gun went off for the 8 am start time, the announcer called out each team's name. Our team name was fairly boring (just our company name) but there were a couple cute ones including the Mad Cow team that was dressed up like cows. I powered up for my first leg by chowing down on a blueberry bagel with peanut butter and banana. My typical meal before morning weekend runs is toast, peanut butter, banana and honey so this was very close to what I used to. My first leg was 7.7 miles mainly ran on the Glacial Drumlin Bike Trail from Cottage Grove to Deerfield, Wisconsin. I started around 10 am and it was already warm hot by this point which made me slightly worried about hydration with only one water station along the route and no van support. But I got a huge break and the route was mostly shaded and mostly flat. *I pretty much think every run is flat when compared to running in Cascade. 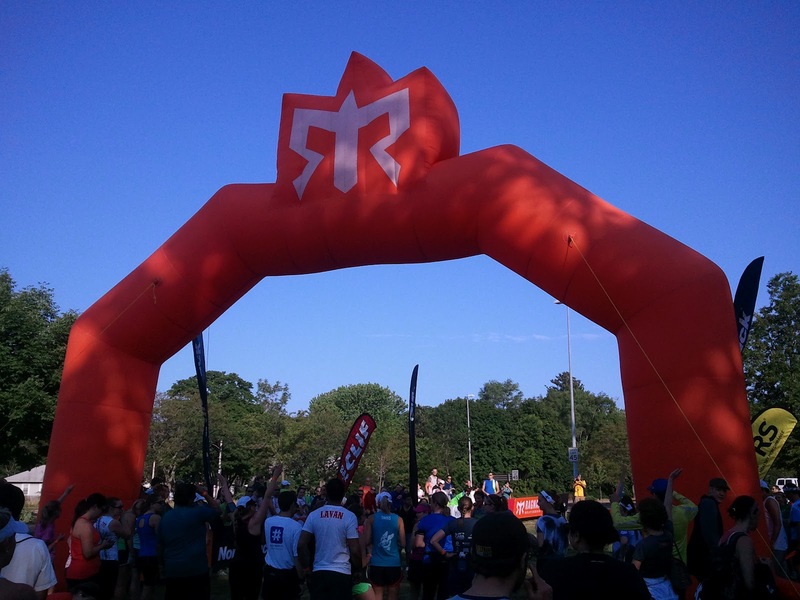 * I tried to keep my pace comfortable for the whole run because I knew I didn't want to tank near the end and I had 2 more runs to power through within the next 30 hours or so. I passed 2-3 people and got passed by about the same amount. The water break between mile 4 and 5 was GREAT! I chugged one cup and dumped another full cup on myself. And then I started running again. 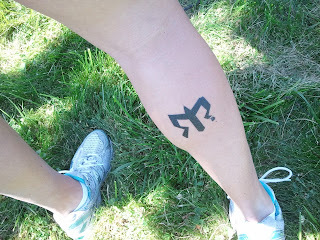 I felt really in the groove and was pleasantly surprise when I hit the 1 mile to go sign. The route departed from the trail here and went through the town of Deerfield to Exchange 5. I picked up the pace for the last mile and it only took me about 7 minutes. Since I HIGHLY doubt i was running that fast, I think the sign was a little off. I zipped into the exchange and then chugged a bottle of water. So satisfying. According to my watch, I finished the 7.7 miles in just over 1:09 for an average pace of 9:05/mile. Me thinks the distance was a bit off because I don't think I was running that fast. 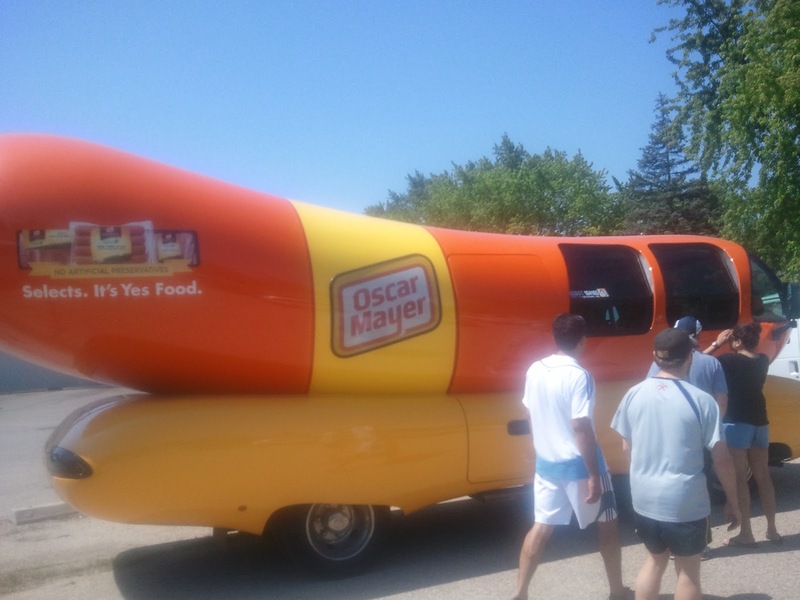 I was also greeted by the weiner mobile post run. I felt really bad for our 6th runner as we had almost 11 miles slated for 1 p.m. He wasn't so lucky and his was out on the pavement with very, very little shade. Thankfully the van was able to stop several times to give him water and gatorade to help him cool off. But he looked like he was struggling. After we handed the slap bracelet off to van 2, van 1 was on a mission to find some food! We ended up at some hole-in-the-wall beach bar outside Lake Mills. We were starving and I ordered some delicious fish tacos. They weren't the best fish tacos I've ever had but they sure hit the spot. After listening to some red-neck Wisonconites (read: middle-aged women chain-smoking and wearing not enough clothing) yell profanities and talking much too loudly about things you didn't want to hear about, we decided to get the heck out of dodge. And we were off to exchange 12 to wait for van 2 to roll back in. I spent the rest of the afternoon lying in the shade and reading some magazines. And then snacking on the addicting trail mix we had in the van. Night hours during Ragnar races require some sweet reflective gear so our team geared up before van 2 rolled in. 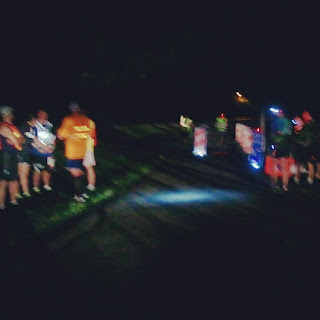 Before my second leg, I threw on a reflective running vest, a headlamp and a flashing taillight. Of course I will also armed with my RoadID and my music player. I was a little nervous about running during the night because again I would be on a trail away from streetlights. The temperature was probably still in the 70s at 10 pm so I didn't need that long sleeve shirt I brought along. Runner 3 slapped on my bracelet and I was off over a bridge, through a gas station, past a stoplight, over the railroad tracks and onto the trail. While I was running through the gas station, a guy, intrigued by the stream of headlamp-yielding runners passing through, yelled over at me. "Hey, what's the marathon for?" "It's a relay. We are running from Madison to Chicago." He probably thought we were a bunch of crazy people and I can neither confirm nor deny that statement. As soon as I got on the trail, I really found my running zen. Running is awesome! I could always see someone in front of me and every once in a while a fast runner would come zooming by. It reminded me how much I love running at night which I did often in high school and parts of college, but don't anymore for safety reasons. The weather was awesome and I felt great. The darkness didn't bother me at all and I was surprised by how much the moon lit up the path. About halfway through I smelled a skunk and I really hope another runner didn't get sprayed because I'm not so sure the rest of their team would have allowed them back in the van. My 4.8 miles was over in a flash and soon we were back in the van headed to the next exchange. At exchange 18, we again handed off to van 2 to take the night shift. Before the van headed off to the Kenosha YMCA to catch some zzz's, I devoured a freaking amazing s'more. Instead of using a Hershey's bar they smacked down a Reese's peanut butter cup. And even better, they were free. I probably could have eaten s'more but we had to get on the road. It was a bumpy ride to Kenosha and I was tired and wanted to be sleeping. By the time we arrived at the YMCA, found our sleeping gear in the van and got in a quick shower it was nearly 3 am. The girls found a spot on the gym floor and even though the floor was hard and uncomfortable and all I had to lay on was a blanket I fell asleep fairly quickly. Only to be rudely awakened less than 3 hours later.